Why I Love is a series of guest editorials on GamesIndustry.biz intended to showcase the ways in which game developers appreciate each other's work. This edition was contributed by Russell Kay, chief technology officer at YoYo Games, the company behind the GameMaker line of game development tools, the latest of which, GameMaker Studio 2, entered open beta on Switch earlier this month. I didn't see Portal coming. I don't think anyone saw Portal coming. The four-hour puzzle adventure tossed into Valve's Half-Life 2 anthology, The Orange Box, presented itself as little more than a neat little curio. A fun side dish to Gordon Freeman's entrée. So when I picked up The Orange Box upon its release, I occupied my nights exploring City 17 and shooting headcrabs. It was during lunch at the office, however, where I dipped into Portal. And good god do those orange and blue ovals have a way of transporting you! Between a homicidal robot captor, abundant Aperture Science cubes and glimpses of themselves through tears in the fabric of space itself, Portal players had all the company they would ever need. Yet Valve didn't just stop there. The portals were the starting point, not the ending one. Instead of simply giving us some joyful little puzzles and calling it a day, Valve fleshed this concept out with the same level of craft and personality that made Half-Life 2 such an immersive experience. 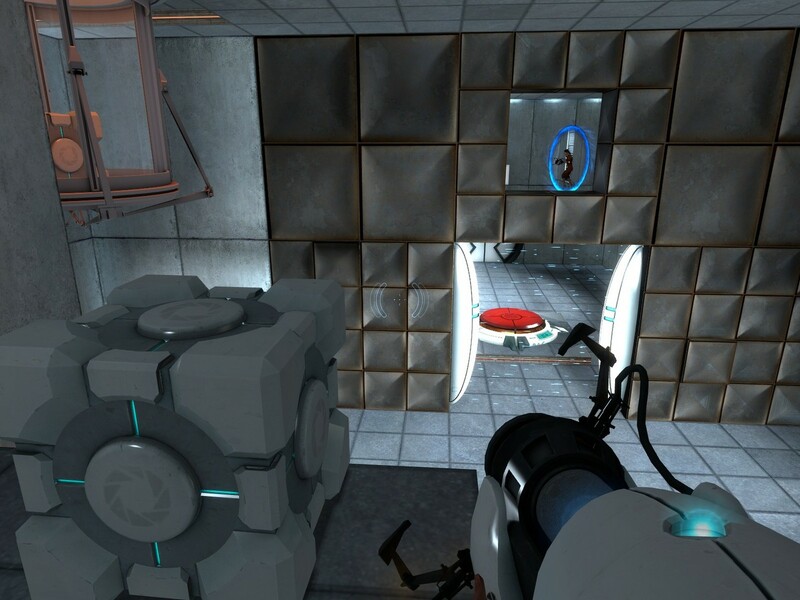 While set entirely within the confines of a singular science facility, Portal fleshes out its cast in a way that not only matches what the studio accomplished in its Half-Life saga, but in many ways bested it. "Portal fleshes out its cast in a way that not only matches what Valve accomplished in its Half-Life saga, but in many ways bested it"
At no point in Portal is the player forced to sit through a talking heads segment of NPCs blathering exposition at you. Instead, the most talkative character is a demented AI that begins as an unassuming entity that's seemingly little more than the futuristic equivalent of the Microsoft Office anthropomorphic paper clip helper, and ends up as one of gaming's most beloved antagonists. Indeed GLaDOS subverts the stereotype of the ominous AI, by having a strong personality with laughably obvious desires as they go about their feeble attempts to diminish your spirits, through comically inept verbal abuse. GLaDOS may not have a heart, but she wears whatever the machine equivalent of that is on her sleeve. "Following Portal is a tall order, not just because it's an amazing game, but because it defied every expectation of what a game could be at the time"
While Portal fired on all cylinders, it was smart enough to not overstep its ambition. It's a very tight package at a mere few hours long, with no fat on its bones. As much as I enjoyed its sequel, something was lost in translation, going from a fresh novelty to a bombastic AAA blockbuster, even if the writing and puzzles remained as sharp as ever. It was like going from The Matrix - something exciting and new - to its well produced, but ultimately familiar and bloated sequels. Following Portal is a tall order, not just because it's an amazing game, but because it defied every expectation of what a game could be at the time. This was 2007, when games came in two categories: full-priced retail affairs, and very small arcade games (think Geometry Wars). We didn't really have modestly-priced, four-hour games back then. That wasn't really a thing. And it certainly wasn't a thing for a major studio like Valve that specialized in high end spectacles. The fact that Portal had almost no marketing behind it and wasn't even being sold à la carte further suggested that it would be a mere bonus feature in the larger collection that was The Orange Box. Slowly discovering that it was so much more than that made it among the most pleasant surprises I've ever encountered in gaming. Portal may have only been a few hours long, but over a decade later it's still a part of me. Looking for a little more Portal love? Sperasoft's Steven Thornton wrote about the sequel for us in a previous Why I Love column! Well, I too also love Portal (and, in fact picked it out of the orange box as the real prize [for my own tastes]) but there are a few inaccuracies herein. 2) Just as Left 4 Dead was initially conceived in basic form by Turtle Rock, Portal was another small group (DigiPen students) gobbled up by Valve and given the money, time and experience to the project to make it shine after their first showing (Narbacular Drop). So really, it wasn't Valve suddenly doing a moderately-priced 4 hr art-piece, it was a group of students doing a 4 hr (though, maybe I'm slow, it took me longer to complete than that, IIRC), moderately-priced art-piece with the budget, facilities and polish provided by a sugar daddy. I'm right there with you about the transition from the first to the second game, though. Portal was a crossword puzzle where you discovered the words and their interconnectedness. Portal 2 was sudoku where you worked within a limited framework. In a crossword you can work out what each word might be from any word in the language it is constructed from but sometimes multiple words can fit each clue and it take a bit of trial and error. There can sometimes be multiple unintended solutions to a puzzle (though modern computer generated crosswords don't tend to have this issue) and there are generally no starting clues for you to work with. In sudoku, you know there must be the numbers 1-9 so you can never have two 9s in the same row. There's only one solution to any given puzzle and there are limited choices/iterations you have to make to get to that solution. Also, depending on the level of puzzle difficulty (not selectable in Portal 2), it can be trivially easy due to the number of starting clues available (like patches of walls blocked off, numbers displayed). I'd also argue that Portal 2 felt too formulaic, polished and rote (mostly I think of the ending song when writing that last one. :) ). I still liked the game and even completed the two-player portion on my own with two PS3 controllers (because it's like sudoku with no creative input from the player, just sequence-learning! ).